Last year, while camping in West Wales, I was called to a sheep kill - attended by the local police - and examined 7 animals (I enclose the story. I was convinced they had been killed by a powerful cat. My sister has seen a lynx in the Brechfa forest - but there were also reports there of a black panther, and I think only a leopard could have killed these sheep and dragged them 50 yards. The distance between the canines was 5 cm - and that is leopard size according to the British Museum. This summer - children, including one of mine - were approached by a large black panther in the Forest of Dean - two weeks before police were called to a sighting in Gwent (reported in the Independent - I guess you would have logged that) and they saw two animals. My thought about the seven sheep was that a mother had been demonstrating to a young animal - some of the bite marks were about 1 cm smaller. Detail of the puncture wound. Last year when close to our campsite on summer holidays in Carmarthenshire, seven sheep were killed in the course of one afternoon, in the very next field to us. Police called at our camp asking had we dogs, and I walked with the officer to the scene. 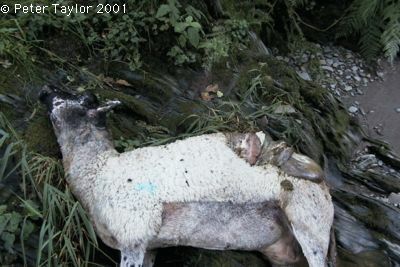 Six of the sheep had been dragged and stashed under the riverbank, the seventh had been partially eaten. Despite the wet conditions I could find no tracks. 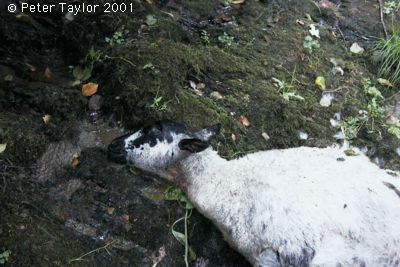 Dogs usually bring sheep down either by snapping at the legs as well as the neck. 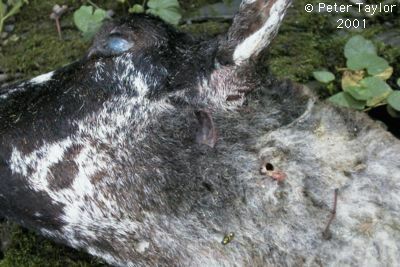 Each of these animals had been killed cleanly by a single bite to the neck - in most instances the canine indentations could be clearly seen. One had been dragged down from the rear and had claw marks on the back so deep that they had ripped through to the intestinal wall - each claw mark clearly defined. The canine holes seemed to suggest two animals - one 5 cm between the teeth, the other about one centimetre less. The policeman conceded it did not look like the work of dogs, and there had been reports of a large black panther-sized cat.